Get off the beaten track in your quest for the perfect Bali souvenirs. Our guide to Bali’s best souvenirs and gifts includes unique and handcrafted items that you simply will never find in mainstream Bali gift stores. Our list of shops and locations to visit will make your trip to buy a gift an experience you will never forget. Whether you are looking for gift ideas and suggestions, a guide to unique Bali souvenirs or you just want to experience visiting the hidden away artisans of the archipelago, then this guide is for you. With just a bit of effort, today’s traveller can experience both the brilliant artistic heritage of Bali and also bring home some of it as gifts and souvenirs. Series of books can be written on the unlimited shopping that Bali offers to its visitors. Many will stop off at Krisna. And don’t get me wrong – a chain store offering relatively inexpensive souvenirs, from fridge magnets to clothes and accessories, situated conveniently, right on the way to the airport, surely makes things easier. 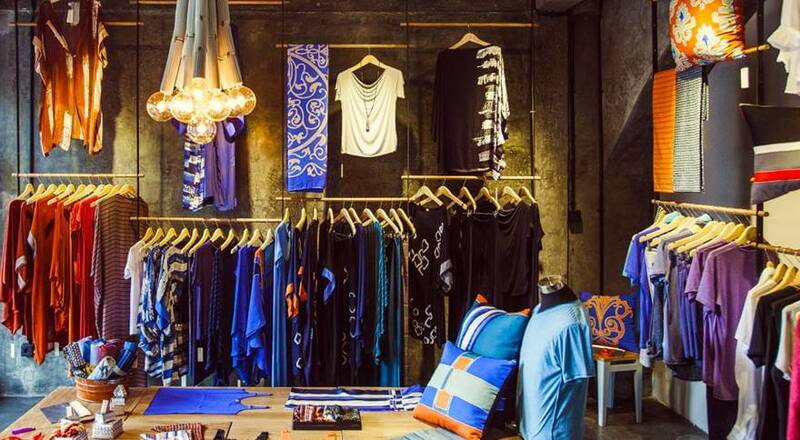 There are also fabulous and creative buys, from clothing to leather goods to carvings, in the established shopping areas of Seminyak and Ubud. However, if you’re not the type to follow the crowd, with a little bit of hunting, and with a nod to the unusual, eclectic and charming, here is how you can find something special and have fun at the same time. The souvenirs we’ve listed are beautiful, unique and also a representation of Balinese culture. Some are traditional; others are inspired by the constant culture of change that is the symbiosis of Bali’s relationship with external influences. 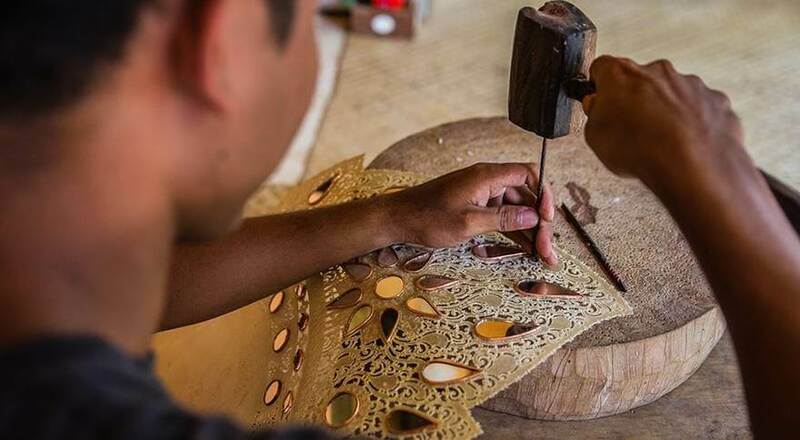 They are made of local materials and support the sustainability of the Balinese craftsmanship. As the economy in Bali becomes more and more focused on tourism, some traditional crafts are sadly becoming endangered. These traditional crafts and skills are being lost to time and age, and to make sure they are supported, you should try your best to buy at the source. 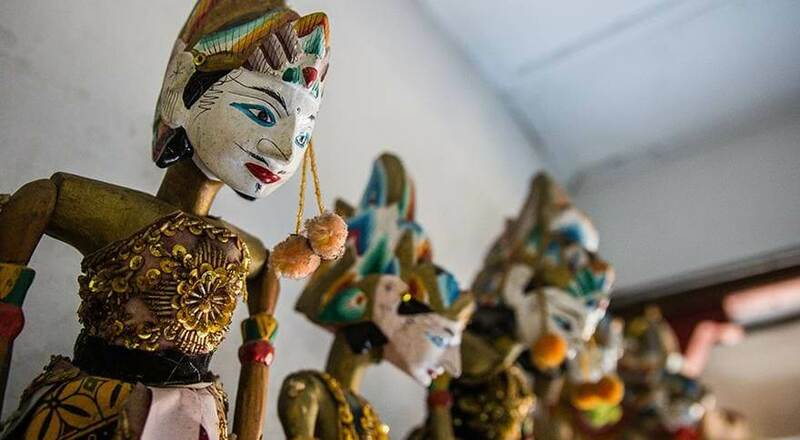 Not only that, but hunting down these crafts is an experience in itself, so make a road trip to buy them at the very source – a journey to Sukawati, Batuan and Amed is a must! Just a tip, some of the map links below will point you to the nearest village and from there the best way to find crafts and workshops is to ask a local – these artisans will all be well-known local heroes! Shadow puppets were first mentioned in a Balinese inscription in 896 AD. The performance brings together dance, drama, literature, visual art and music. It is a one man show hence the puppeteer (dalang) needs to be a true expert. Beautifully handmade puppets include kings, heroes, gods and animals, known from the Hindu epics, the Mahabharata and Ramayana. Made of flat cow hide with a wooden handle, Wayang Kulit is chiselled, coloured and has a conventional headdress to be easily recognisable. The style has hardly changed in hundreds of years. The eyes and headdress are the crucial parts of the puppet, because the eyes reveal expression and the headdress indicates status. The colours represent values in Balinese society, for example, white represents purity, green fertility and black evil. The most important one is the Kayonan, shaped like the Tree of Life. Its appearance indicates the start of the story and brings the puppets to life, introduces changing scenes and the end of the spectacle. There are many more meanings and ways to identify characters. Sukawati Village, known to the tourists for its local art bazaar, is known to the Balinese to harbour the magic of traditional theatre performance, and this is where you should head to find the workshops. The best part? You don’t need more specific address or opening hours! The workshops are situated in family compounds and they gladly welcome all the curious visitors. If you ask anyone in the village, they’ll happily point you to an artists home, they’re famous. There are two shops we recommend. Komang Sudiarsa is not only an incredible craftsman but also a talented performer. The craft has been passed in his family through generations. Komang started learning at the age of 6, taught by his father. Komang will happily animate hundreds of his characters from his collection, and they are available for sale and framing collection. The Dharma Yasa Workshop where Yasa works from is a part of a traditional Balinese compound house. Masks and costumes, theatre decorations and puppets, finished and in different stages of production, can be found lying all around. Yuda and his grandfather will gladly walk you around, sharing their experience. Prices depend on materials and time spent on making the puppet. Close to Sukawati is the village of Batuan, famous for its traditional masks and costumes that are used in dance and drama performances. The masks in Bali are of ancient origin and sacred. They represent the faces of gods and heroes. 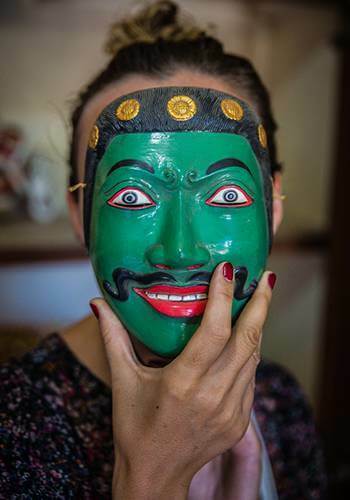 The masks “speak” – the Balinese believe that the spirit of those portrayed lives in the mask, leading and inspiring the performance of the actors. Most recognisable are the Barong and Rangda masks. The Barong is the magical protector of Balinese villages. His opponent is the witch, Rangda, who rules over the spirits of darkness. Their dance symbolises a battle between good and evil. During the Galungan and Kuningan festivals, the Barong wanders from door to door cleansing the territory of evil influences. Batuan is a tiny village, driving past it you’ll easily find little workshops, so picturesque and colourful, it’s nearly impossible not to stop at least to take some pictures and haggle for a take home gift. 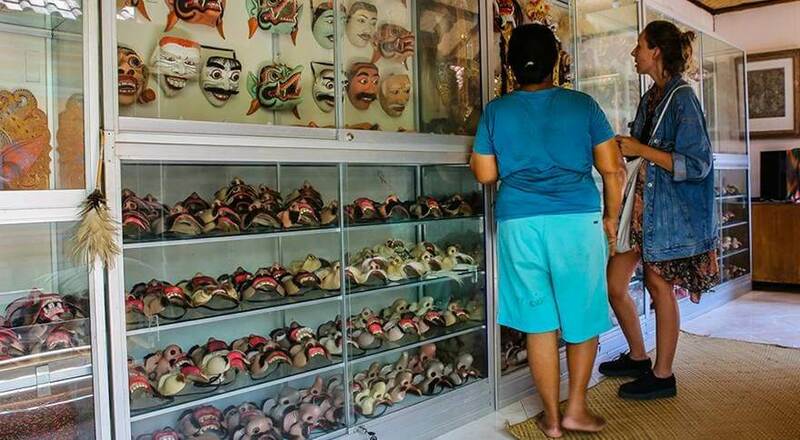 You can find really striking masks in Batuan. They are pieces of art and make for exceptional decoration. Simpler masks can be bought for <550,000 IDR (£28/€32/$40), and more elaborate masks with multiple layers of intricate painting and decorated with silver and golden plated headpieces, that take months to make, can cost over 2,000,000 IDR (£108/€120/$150). 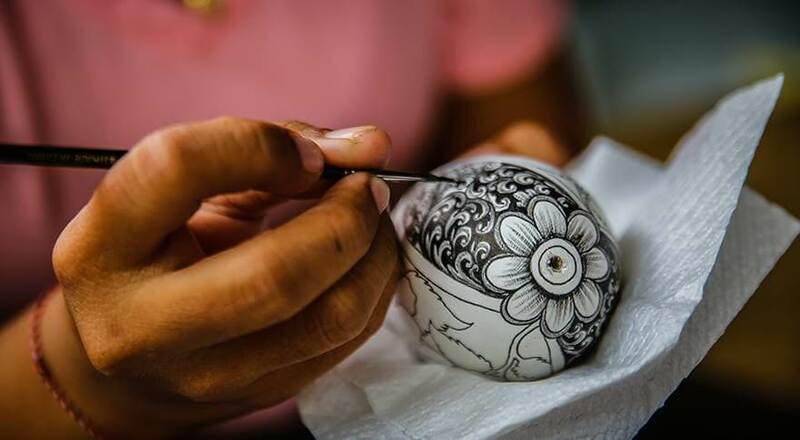 The history of egg painting goes back to ancient times and, it is told, reflects the beginning and the struggle of life. The egg symbolises our life and the process of painting is our creativity. Creating patterns on the fragile egg shell symbolises the beauty we can bring to our existence. At the beginning, a young student (murid) learns to meticulously copy a design provided by the master. However, individual creativity and imagination is highly encouraged. Complicated ornaments, wild animals (looking like they come straight from a Henri Rousseau painting), everyday scenes, and Hindu gods are gently applied to wooden or natural eggs. Exotic cassowary and swan eggs may also be carved with Faberge like precision to turn them into a truly unique decoration. Batuan Village is a great place to visit one of the famous egg painting shops and watch children as young as eleven learning how to decorate eggs with incredible precision and thoroughness. Also carved in Batuan are seashells that you can find encrusted with silver and turned into gorgeous jewellery pieces. 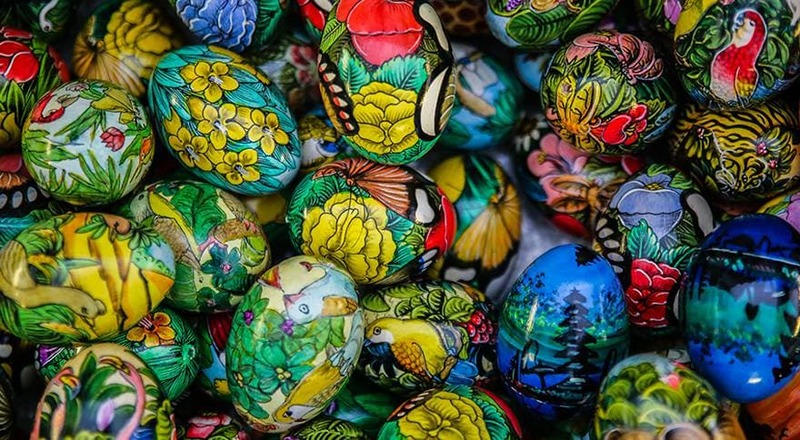 The prices of painted eggs vary from 50,000-200,000 IDR (£3-11/€2-12/$4-15), for the carved ones, up to and over 1,000,000-1,500,000 IDR (£50-80/€60-90/$75-110) for more intricate designs, depending on the amount of time spent on the piece, the size and material used. Traditional Balinese textiles are famous worldwide. As with other forms of arts and crafts in Hindu religion, they play an important part in daily life and ceremonies. Textiles in Bali indicate the status of the person who wears them. Male textiles are also believed to hold magical, protective powers. According to the mythology it is Ratih, goddess of the moon, who taught men how to weave clothes from vegetables offerings. Worth mentioning here is the hand woven textiles (as well as baskets) commissioned by the Threads of Life. It’s a fair trade business with a mission to use culture and conservation to alleviate poverty in rural areas of Indonesia. The heirloom-quality textiles and baskets are made with local materials and natural dyes and support weavers in expressing their cultural identity while also helping to build their financial security. The retail outlet in Ubud brings the textiles and baskets from rural Indonesia to the tourism centre. The store offers a diverse range of products for a range of budgets, and is worth a visit. Quarzia is set in the middle of Ubud and is a design studio creating unique garments. Every piece of exquisite silk, linen or cotton clothing is handmade by local skilled artisans. Their focus on using only the finest fabrics and highest quality dyes results in unique and remarkably beautiful garments. It is a one of a kind blend of Indonesian artistic tradition and Italian contemporary design. Fabric is available from virtually all traditional markets in Bali. There is a wide range of textiles available, but here is our pick of the most common, how to identify them, and likely prices. This is the ubiquitous black and white checked cloth that is often wrapped around the statues, buildings or even trees and stones. In Balinese religion, these inanimate and objects are believed to have the spirit dwelling inside them. Poleng represents the cosmic duality. Good and bad, day and night, mountain and sea; one cannot exist without the other. Poleng is the perfect representation of it: white represents good and black represents evil. 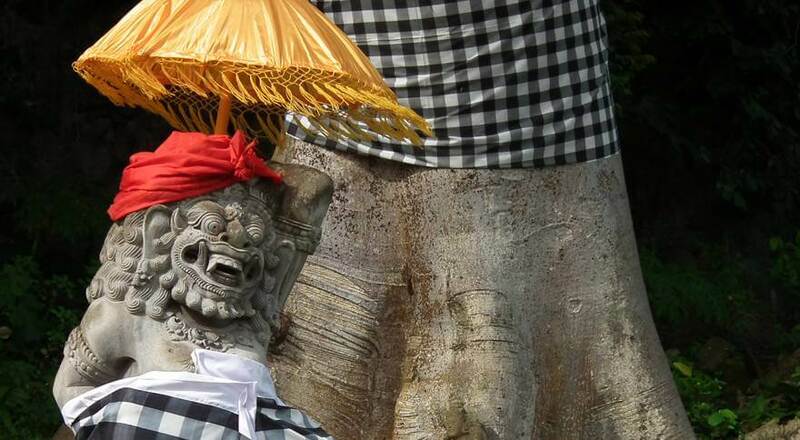 In South Bali, if the statue is a male, it will be wrapped in poleng, if it is a female, it will wrapped in white cloth. If a poleng has a red edge around it, it represents the Trinity of Brahma, Vishnu and Siwa. Ikat (or ikkat) is a dyeing technique used to pattern textiles with pre-dyed yarns prior to dyeing and weaving the fabric. 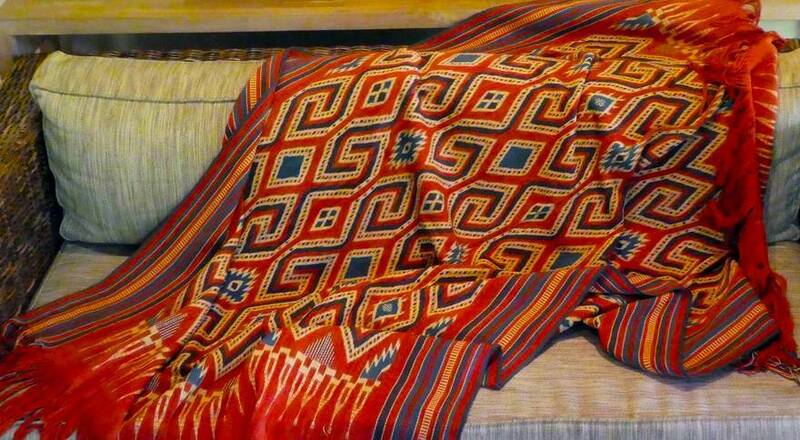 The design can be applied to the vertical thread (warp ikat), the horizontal one (weft ikat) or both of them. If the designs are applied to both warp and weft, it is called double ikat. In Bali you can find the weft ikat (known as endek) and double ikat (known as geringsing). Endek is the most common balinese textile. Basic designs are irregular and have soft wavy patterns. Geringsing is very difficult and takes a long time to make. It is only made in three places in the world: Bali, Japan and Gujarat in India. Tenganan is the only place in Bali where the double-ikat process is practiced. Singaraja in north Bali is known for the best ikat. Gianyar and Sideman also have many ikat factories. If you are looking for a bargain, try any of the traditional markets. 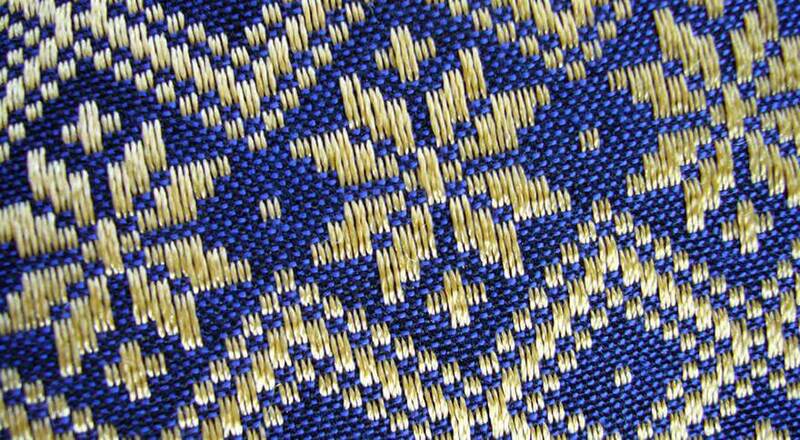 Songket is a technique in which additional patterns are woven into a material with supplementary gold and silver weft threads. It is used as the ceremonial, and as such, best quality dress of all Balinese. New songket of various quality is still woven in Klungkung. The price depends on quality. Often the price of a songket is over 1,000,000 IDR (£53/€60/$74). The best can cost over 3,000,000 IDR (£158/€178/$220). Like ikat, songket is easily found in many traditional markets in Bali. Perada is the technique of decorating the base fabric (cotton or silk) with gold leaf or gold dust. The gold is glued to the pattern. Originally it was restricted to being worn at court and by men. The gold easily rubs off, therefore people only wear these items of clothing for special occasions, like weddings. Perada decoration is also used to make traditional dancer’s costumes. Batik is a UNESCO recognised part of Indonesian heritage. Many people who come to Bali ask for traditional, Balinese batik. Unlike ikat, batik was never really made in Bali until recently. Relatively new, it has been a fast-growing industry, quickly adopted by the Balinese and has become popular with foreign tourists. In true Balinese style, the strong connection with the natural world in Balinese spiritual life, like frangipani and hibiscus flowers, leaves, birds or fishes are evident in local batik cloth. Motifs inherent to Bali, and inspired by nature, now appear alongside patterns influenced by tourism and modern life. A copper block is used to print a design across the fabric. Batik is a method of dyeing cloth (cotton or silk) by applying warm beeswax, mixed with paraffin, resins and fat. The pattern, left unwaxed, after the dying process stays uncoloured. The wax is then removed in warm water and the whole process repeated with each colour. Silk is dyed only on one side. For a more beautiful result, cotton fabric is dyed on both sides. 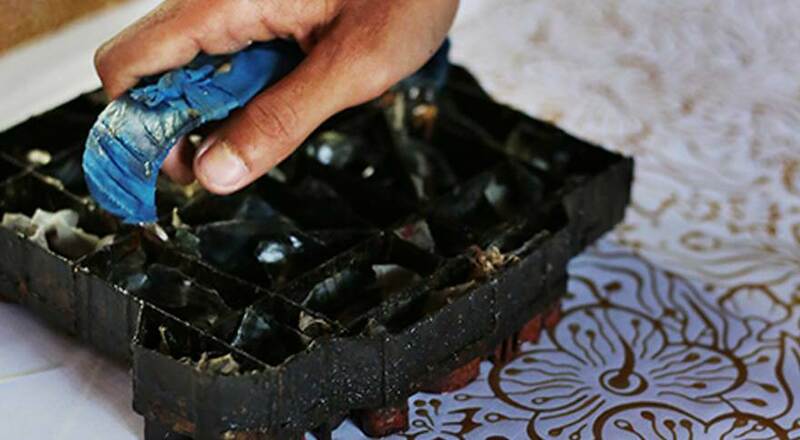 Molten wax is applied skilfully by hand for batik Tulis and by using a copper pattern block for Batik Cap. How the Balinese make batik is really fascinating. The main manufacture centre for batik is in the Gianyar district. The factories can be easily found and visited. You can also find batik clothing in local markets and boutiques, and there is also one in Sukawati. Just like textiles, Balinese bags and baskets can be found everywhere around the island. Baskets, boxes, fashionable boho bags and platters with different weaving patterns are handmade in Bali, commonly from ata straws or lontar palm. Ata is a type of vine which is indigenous to the volcanic foothills of of Bali. Ata is much stronger than rattan and more rigid than straw. 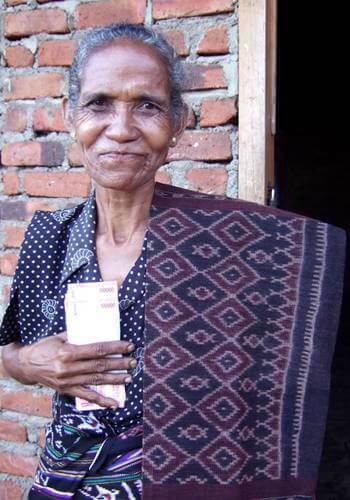 The unique weaving process originally used by the skilled artists of the Bali Aga aboriginal tribe from Tenganan village makes it particularly durable. Products are said to last over 100 years. The baskets come in every size and shape and can be used in so many ways and make beautiful gifts. The lontar palm is a tall fan palm, traditionally used for centuries in Bali for its high yielding & sustainable hard wood and sweet sap that is a source of palm wine and sugar, and its leaves are used for thatching and weaving. The palm is soft and delicate to touch, which makes products made from it feel luxurious. Muntigunung Community Social Enterprise produces high quality handmade baskets produced by local families in the remote area of Muntigunung, Northeast Bali. They strive to create employment opportunities and improved quality of life for disadvantaged families. The program has also secured a clean & sustainable water supply, as well as access to healthcare & education for locals. They also create wonderful hand-woven hammocks that are especially worth checking out. The origins of the ceramics and pottery tradition in Indonesia can be traced back to trade with China, dating back to 205 BC. Ceramics come in the form of everyday vessels and plates, passed through generations. Finer pieces, like beautiful jewellery, are usually unglazed, hand worked and often left unpainted. Balinese ceramics and pottery show a stronger western influence than those produced in Java. Mentioned by the Wall Street Journal, Gaya Ceramic and Design, based in Ubud, is described as a studio that ‘meets Italian sophistication with Balinese craftsmanship, to produce custom tailored, hand-thrown ceramics, crafted with unparalleled excellence in Porcelain, Stoneware and Raku clay’. They are brought to life with a passion to create, and in equal measure, a passion to share, by Marcello Massoni and Michela Foppiani. Their studio and art centre fit perfectly in the Bali tradition of sharing multicultural skills and artistic references. This unique, local product has been manufactured with the same processing method since the 18th century, where this methodology has been passed down from one generation to the next. The salt is well known for the quality, pure white colour and small to medium – sized, flower shaped crystals. This is the result of drying the filtered ocean water in long, hollowed coconut logs. Unfortunately tourist development has forced many farmers to sell their lands or to switch into hospitality and the once ubiquitous sea salt farms are now on the verge of extinction. However, located on the west coast of Bali, Amed village is well known for scuba diving, a peaceful, cozy atmosphere and stunning sunsets behind Bali’s most sacred volcano, Mount Agung. Walking down the beach, you will easily find some of the remaining salt farms. Watch the production, take a picture of scenes that could just as well be happening 200 years ago, and buy some salt. 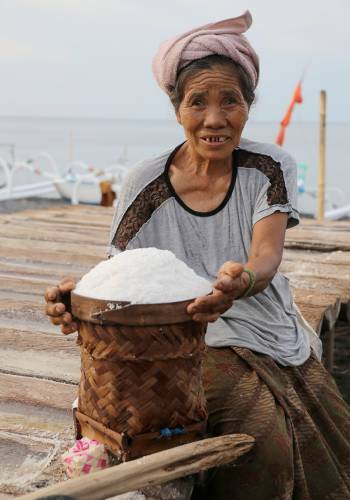 To support the preservation of this important heritage and help the economy of Amed farmers buy MPIG products (it’s a local association of sea salt producers, founded to support the remaining farms, protect the fair trade and try to make Balinese sea salt more recognisable worldwide product. The salt is nicely packed and ready to be an unique gift from Bali, perfect for any foodie or cook. Price starts at 20,000 IDR (£1/€1,2/$1,5) per kilogram (if you buy it straight from the beach vendor or farm worker), and goes up to 45,000 IDR (£2,4/€2,6/$3,2) if bought in a box. Not exactly rooted in balinese tradition, but the art and craftsmanship of preparing preserves is a perfect representation of a fusion of skills, old and new production techniques, as well as a mix of foreign and local approaches and tastes, creating a unique symbiosis between them. Bali and the volcanic archipelagos of Indonesia have a natural, sustainable and abundant resource – fresh topical fruit – which makes artisan products a very special gift or souvenir from the Island of Gods. Awani Bali are an award winning artisan food enterprise creating tropical fruit preserves and condiments. They offer a perfect blend of local exotic flavours, western craft of making preserves by hand, and balinese culture, placing great importance on creating something of beauty by hand and doing it with care, refinement and elegance. Awani Bali puts focus on not only creating a great quality product, but also preserving the traditional farming practices and equipping local staff with the skills and confidence needed to embrace the modern, commercial world, whilst continuing to celebrate their exquisite, indigenous culture is truly remarkable. Jars are often wrapped in custom-made batik fabric, inspired by the wonderful aesthetic of Balinese artistry and culture. The delicate motifs on gift boxes feature tropical fruit flowers including tamarillo, mango and tangerine, all of which grow across the island. Served in over 80% of the islands luxury hotels, you can find Awani Bali gift sets in many outlets across the island, including the Airport, and in some of the best gift shops in Bali – such as Four Seasons Resort Jimbaran, Nusa Dua Beach Resort and Ayana Resort and Spa. Awani Bali make high quality handcrafted preserves. 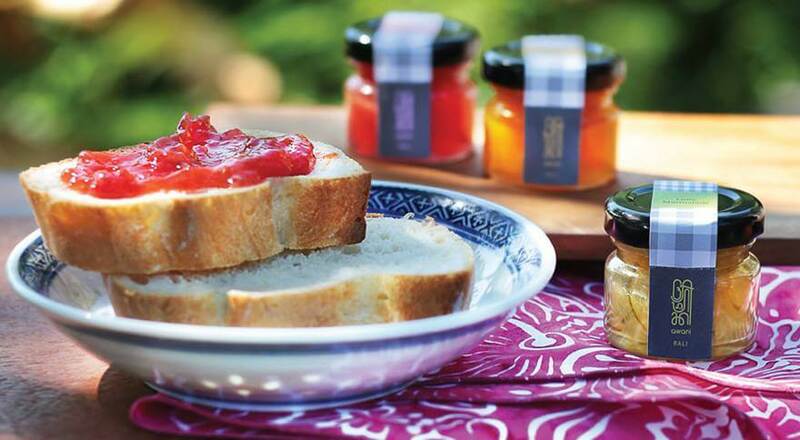 In Ubud, stop by Confiture de Bali to try out preserves made from local fruit on a hot crepe. Confiture are focused on natural, local and traditional. They’re passionate about providing natural products of a really large variety of flavours and homemade feel. Address: Jl. Gootama No.26, Ubud, Kabupaten Gianyar, Bali. We’ve mapped out all the best spots for souvenirs in Bali to help guide you around the island – grab a scooter or a driver and make it a road trip. 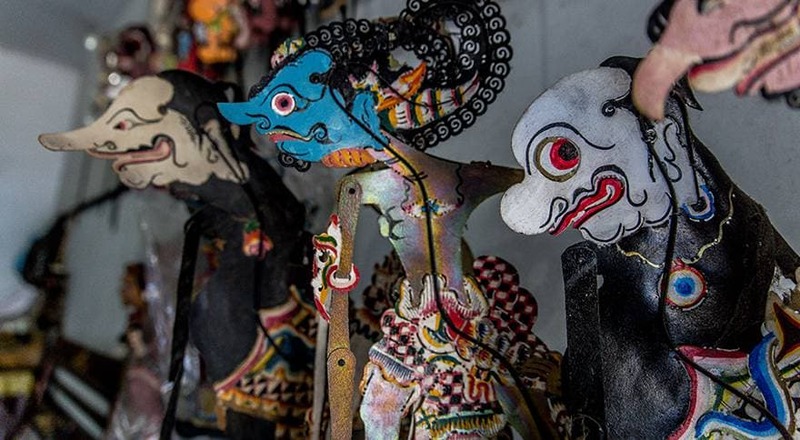 What’s been your favourite Bali souvenirs? We’d love to hear your feedback, or if you have a question about gifts and souvenirs in Bali or any of the experiences we’ve covered, please post in our comments. class="post-template-default single single-post postid-1750 single-format-standard samba_theme samba_left_nav samba_left_align samba_responsive woocommerce-no-js wpb-js-composer js-comp-ver-4.12 vc_responsive"